Sue Ellen Thompson (Ed. 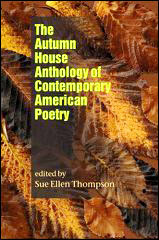 ), Autumn House Anthology of Contemporary American Poetry (2005), Autumn House Press, ISBN: 19322870067 The Autumn House Anthology of Contemporary Poetry is an exciting collection of work from more than ninety of the best poets writing today including Phillip Levine, Rita Dove, Stephen Dunn, Jean Valentine, Gerald Stern, Maxine Kumin, Tony Hoagland, Denise Duhamel, Nick Flynn, Jo McDougall, Tim Seibles and many others. The volume includes a full-page photograph and short biography of each poet. At the 31st Foothill Writers' Conference (2007), poet Andrea Hollander Budy recommended this book to students in her workshops. She has taught poetry writing for many years and says "There's not a weak poem in the entire collection in this book. Based on her inspiring seminars and poetry exercises which have helped many writers, this book is strongly recommended for aspiring poets. Kabir Helminski (Editor), The Rumi Collection: An Anthology of Translations of Mevlana Jalaluddin Rumi (1999), Shambhala Publications, ISBN: 157062531X A Sufi poet and mystic of 13th-century Persia, Rumi (1207-1273) is one of the literary and spiritual greats of all time. This anthology comprises the work of nine translators, so we may hear the voices of Coleman Barks, Robert Bly, Nevit Ergin, Andrew Harvey, William Hastie, Kabir & Camille Helminski, Daniel Liebert, John Moyne, and Peter Lamborn Wilson and gain a better sense of Rumi's voice behind them all. In recent decades, Rumi's poems have been read perhaps more than any other poet in North America. He speaks to us because we recognize Rumi as a cosmic human being, calling us to tap into the infinite and eternal. In Rumi, the divine and human realms intermingle our spiritual dimension and our human nature find joy in being united. Rumi is the clearest, most powerful voice of divine, ecstatic love that God could be the Beloved of humans and vice versa. There are so many gems in this book that you will experience countless ephiphanies. Make Rumi your mentor. Listen to his Mathnawi I.91: Discipline enabled Heaven to be filled with light; / discipline enabled the angels to be immaculate and holy. Now practice, practice, practice with delight. William Harmon (Editor), The Top 500 Poems (1992), Columbia University Press, ISBN: 023108028X Here are the 500 English-language poems that have appealed most often to 400 contemporary editors, critics, and poets for inclusion in their own widely disparate anthologies, which were indexed in the 9th Edition of The Columbia Granger's Index to Poetry. These are the poems in English of the last 700 years that have risen to the top of the Poetry Chart arranged in chronological order from Chaucer to Plath. Harmon introduces each poet with a brief biographical sketch, and with pithy, insightful comments situates each poem in its proper context. You could read the poems chronologically, or by popularity (An Appendix lists them in the order they were most often anthologized), or simply at random the 1132 pages lay flat! This is a wonderful anthology, beautifully bound with wide margins and clean layout a good reference book for poetry lovers. Avg. Review (2): See the Top 100 Poems from this anthology. Denise Levertov, This Great Unknowing: Last Poems (1999), New Directions, ISBN: 0811214036 When Denise Levertov died on December 20, 1997, she left behind 40 finished poems, which now form her last collection, This Great Unknowing. Few poets have possessed so great a gift or so great a body of work when she died at 74, she had been a published poet for more than half a century. Although the poems in this book have not been organized with the incredible care Denise Levertov exerted on the more than twenty collections she published with New Directions in her lifetime, the poems themselves shine with the artistry of a writer at the height of her powers. She will be sorely missed, as Robert Hass remarked in The Washington Post, remembering walking once into a classroom where she had been teaching and seeing scrawled across the blackboard in her hand these words: 'Accuracy is always the gateway to mystery. ' The book's title is from her poem Translucence where she perceived holy faces in everyday life: I perceived that in such faces, through / the translucence we see, the light we intuit / is of the already resurrected, each / a Lazarus... / They know of themselves nothing different / from anyone else. This great unknowing / is part of their holiness. They are always trying / to share out joy as if it were cake or water, / something ordinary, not rare at all. Beautiful. Spoken like an angel. 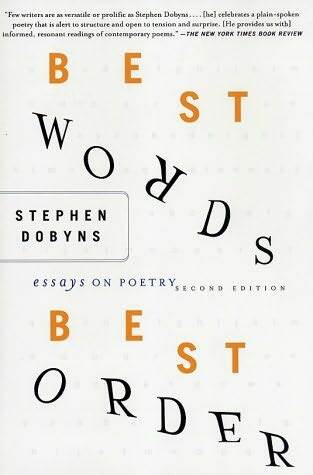 Stephen Dobyns, Best Words, Best Order: Essays on Poetry (2nd Ed., 2003), Palgrave Macmillan, ISBN: 1403961476 In this collection of essays about poetry, Stephen Dobyns celebrates Coleridge's dictum that poetry is the best words in the best order. Dobyns's probing examinations of the elements of poetry metaphor, pacing, tone and his study of the evolution of free verse are intended for serious students of poetry. Dobyns, the author of 15 volumes of poetry (and 21 novels), believes, like Baudelaire, that "each poem ... has an optimum number of words [and] an optimum number of pieces of information ... and to go over or under even by one word weakens the whole." Poetry, he says, belongs to the reader, not the writer, and as readers, "at the close of the poem, we must not only feel that our expectations have been met but that our lives have been increased, if only to a small degree." And, if that's not challenge enough for the writer, add to it "that the conclusion of a given piece must appear both inevitable and surprising." The final third of the book comprises chapters on four writers, each of whom represents to Dobyns an ideal in poetry: Rainer Maria Rilke, who Dobyns says worked harder than any other poet to develop and change his work; Osip Mandelstam, an exemplar of moral centeredness; Anton Chekhov, for his sense of personal freedom; and Yannis Ritsos, for his "sense of the mystery that surrounds us."